This is an intelligent piece of cinema that engages with a pressing contemporary issue. The film invites you to be the decision-maker as to whether or not the trigger is pulled. I saw it with a bunch of friends and the debate over pizza afterwards was intense. 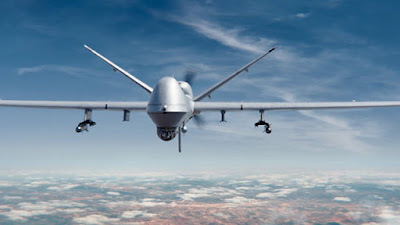 Filmed in South Africa but set mainly in Kenya the story follows a British led drone surveillance operation tracking some of Al Shabab's most wanted in the hope of capturing them alive. Among their number are both British and American nationals. The mission changes and the film tracks, in real time, the chain of decision-making that tries to integrate military, intelligence and political imperatives to deliver an outcome. The plot offers an exploration of normative ethics in a real-life situation as utilitarianism is employed to justify certain actions. The military imperative is clear but the potential for collateral damage means that political decisions are not easy. Meanwhile, a drone pilot in a cabin in the Nevada desert sits with his finger poised on the trigger taking orders from a UK Colonel in Northwood in North London while she is receiving intelligence from Hawaii and liaising with troops on the ground in Nairobi. Her General is in a COBRA meeting in Whitehall with the politicians ensuring that any proposed action is legal. Going into the meeting the General is preoccupied with buying the right doll for a little girl. It is another little girl and her playful activities that come to be the centre of the plot. The acting is tight. The way the edits jump between the different locations demonstrate how global, warfare now is. The film also drives home how clinical and focused warfare today has become and how sci-fi has become mainstream as a man in Las Vegas targets people in one room of a house in a Nairobi suburb. In a way it makes it even more detached from my reality than 'old-fashioned' warfare with fronts and armies and arrows on maps. If we live in a democracy we are in effect asking these people to carry out these killings on our behalf. The alternative is equally distressing. The morals of war are being muddied as new technologies make surgically precise missions more possible. That surely is a good thing - isn't it? Helen Mirren is in the lead role as Colonel Katherine Powell and in his final performance Alan Rickman gives full force to his character Lieutenant General Frank Benson. His voice as he delivers the final speech to the simpering politician Angela Northman "Never tell a soldier that he does not know the cost of war. "(Monica Dolan) could cut through plate steel like a laser! The screenplay offers a contrasting view of how men and women, politicians and military, Americans and Brits all approach the same difficult question. The part of Powell had originally been cast for a male actor but Mirren makes it all her own in her combat fatigues in her underground bunker barking orders at her subordinates. Had it not been for Northman's early intervention the film would have been a lot a shorter. The British politicians are depicted as being impotent and facile whilst the Americans are shown to be decisive and unwavering. For those with an interest in personality types, the main debate explores the tension between those who have a preference for being 'Feelers' and those whose preference is to be a 'Thinker'! The film is not without its flaws but these are more than compensated for in the bravery of tackling this subject in such a direct and engaging way. I really liked it and will be adding it to my collection of discs when it becomes available. Do go and see it - and think about how happy you are that people in the Nevada Desert are protecting your safety by killing people in Kenya. Sadly a scenario becoming increasingly common around our shrunken globe. I'll give it 8/10.